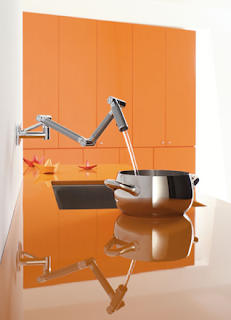 I remember the Karbon faucet when it first came out — not all that long ago, I suppose. I also remember a cute video (at least I think I do, because I can't find it anywhere) of the Karbon looking around the kitchen and inspecting things, also filling up a glass of water next to the sink. I've gone through a few of the Kohler videos (zzzzz) and I am now convinced that someone merely used it for a stop action movie. Of course, I may have dreamed the whole thing up. It's not the carbon fiber that makes it work, by the way, though they've emphasized that aspect of it. What the engineers managed so cleverly to produce was joints with an almost magical coefficient of friction. The faucet can be moved, but it stays where it's put — no mean trick. I can only imagine how many versions collapsed once the water was turned on. Of course, coefficient of friction isn't as catchy (or as accessible) as carbon fiber. If you've seen Porsche pens made from sections of braided brake line, then you've seen the probable inspiration for the Karbon. I agree with you about the wall mounting. It's really snazzy. It also comes in colors, maybe for a long time now. My problem with the faucet has always been that they expect it to exist in an all adult world. I'd like to know where that is exactly. They don't show water spraying across the kitchen or running in sheets off the counters and down the back porch. Of course not. It's not supposed to be used that way. As the father of two once hyperactive children (at least borderline hyperactive) I can assure you that the Karbon faucet, as beautiful and as fascinating as it is, would be more tempting than a WET PAINT sign. Hand showers pose a similar threat, don't they?